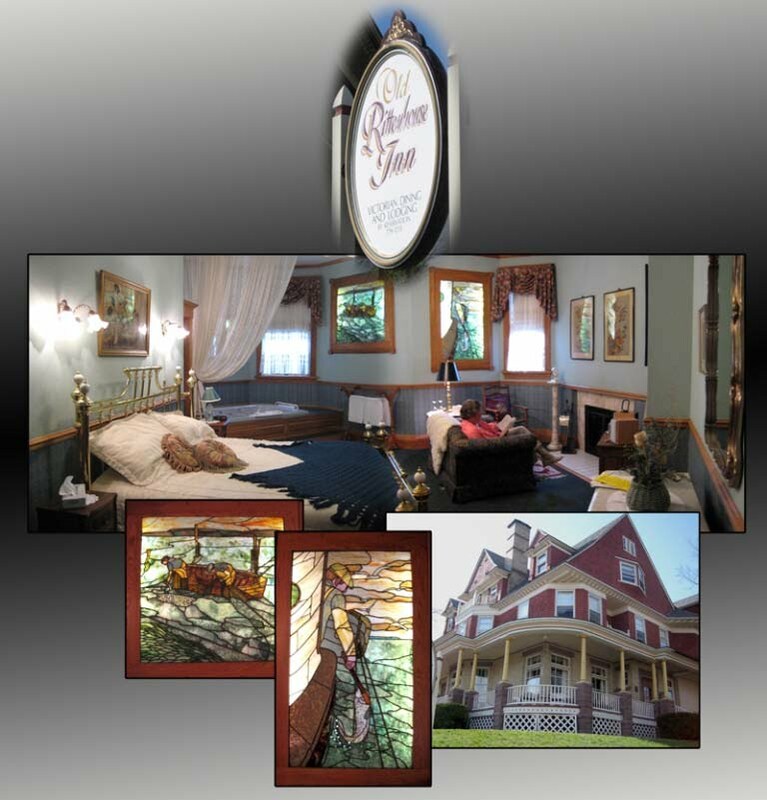 We recently spent two delightful nights at the Old Rittenhouse Inn in Bayfield, where they treat you like royalty. Our first floor spacious room was furnished with a fireplace, whirlpool and stained glass windows. Here's a video tour! The home is decorated with period antiques and includes a lovely collection of various types of glassware. Our breakfast table was right next to the china cabinet (similar to Ma's) and a birds-eye fireplace, and tucked between two windows overlooking the bay and Madeline Island. Below is a collage of images where Nora can be seen relaxing in front of the fireplace. On Friday evening we attended the Rittenhouse's "Wild Food" reception at the La Chateau Boutin , where we also toured ("Click Here" for 360 tour") this fabulously restored home. The carved woodwork is all original and is an eclectic collection of oak, flamed birch, myrtlewood and maple. The house's style encompasses at least 5 different eras, including craftsman, art nouveau, art deco, and gothic. As part of the restoration the owners have applied a coat of tung oil annually for 20+ years to all woodwork in the home, gradually restoring its luster. The original wood was never painted or varnished and is now outstanding. The home's antique furniture was also crafted from many species, and includes a stunning birdseye maple cabinet in the music room, plus the original wildly-differing light fixtures are all intact. Since a variety of styles are showcased in our home, too, it was really enjoyable to visit. The reception featured local meats, fish, and natural foods. We feasted on duck canapes, wild rice and lamb stir-fry, smoked salmon, trout spread, wild onion guacomole, cranberry bread, wild onion/herb bread, lamb meatballs sauced with fiddlehead ferns, assorted cheeses, smelt, wild rice and raspberry cookies, and fresh strawberries, all accompanied by a large assortment of wines. We were exceedingly thankful we didn't eat dinner first! On Friday we attended the live broadcast of Larry Meiller's WPR "Garden Talk" at the Bayfield Pavilon. As stated on the WPR site: "Every Friday, Larry's program is devoted to one of the favorite pastimes of public radio listeners -- gardening! 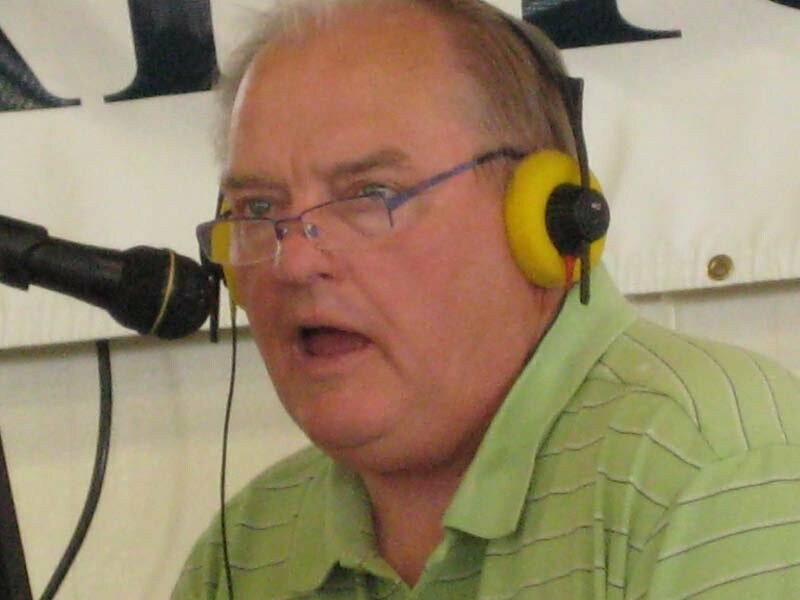 Each week a different guest expert with a gardening speciality joins Larry and answers the questions of listeners." One of this program's 3 guests was Don Kissinger, DNR Urban Forestry Coordinator, who happens to be Nora's cousin's son. It was a pleasant surprise to see Don there. You can listen to the recording of the Garden Talk program we attended. 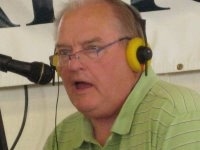 "Click Here" for Larry Meiller's WPR web site for the May 16 Garden Talk program. On the web site click on "Listen to this program". Saturday was a beautiful sunny, warm day. We took a 55 mile boat tour of the Apostle Islands. The highlight of the tour was the Sea Caves on the northern end of Devil's Island, but we saw lovely views on the entire 3+ hour cruise. We now know the rock for Chicago's brownstone buildings was mined on those islands. Saturday evening found us having an exceptional dinner at the Wild Rice Restaurant. It had just opened for the season on May 8 but the staff and facilities were in full swing. The food was delicious, the service was exceptional, the views and evening sun highlighting the tree tops and the distant shores of Madeline Island were a feast for our eyes...and the chocolate moose dessert with grand marnier ice cream was extraordinary. 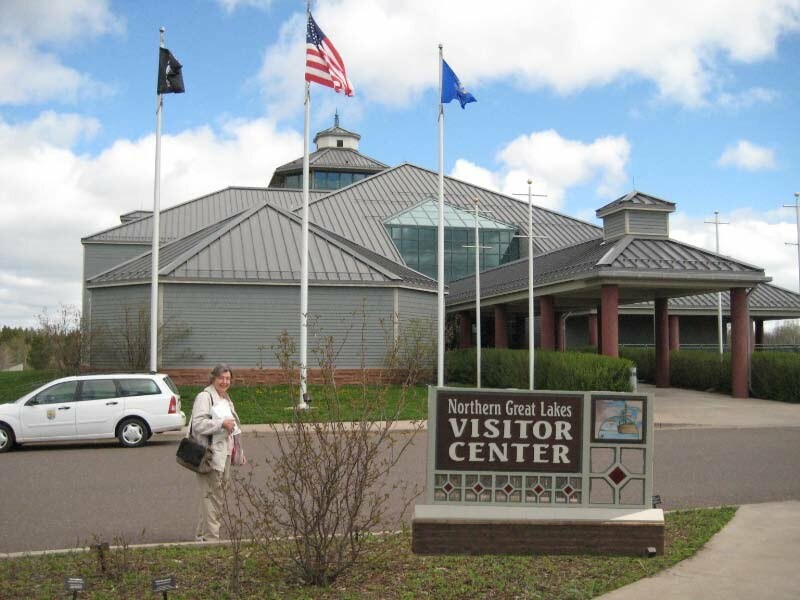 If you're ever in northern Wisconsin near Ashland, the Northern Great Lakes Visitor Center is conveniently located at the intersection of County Hwy G and US Hwy 2. It's well worth the stop and is only 2 miles west of Ashland. ...and the floor is constructed of wood from Timeless Timbers (see Ashland, WI below). NGL's excellent exhibits are enhanced by numerous activities and events. Sunday morning we visited Ashland, WI, briefly and were intrigued by the many large, interesting murals on city buildings. We also wanted to visit Timeless Timbers woods, which features lumber and products recaptured from 100 year-old submerged Lake Superior logs. Unfortunately, they're closed on Sundays. As their web site states: "Timeless Timber guarantees that the wood purchased from us is from rare old-growth timber that was 250-500 years old when cut and was underwater from 75-150 years before being recovered. Indicative of Virgin Growth woods is the tight ring patterns. When you look at second growth commercially grown timber today, you will notice very few growth rings per inch. Where second growth timber may have 5-8 rings of growth per inch, Virgin Growth Timeless Timber may have 15-30 rings per inch." While we have a Wisconsin trivit made from their wood, it would be fun to make a special project from these unique specimens.